Philips Norelco Latest Wet/Dry Shaver! First Of Its Kind With A Qi Charging Base! Prepare Faster And Look Better Every Morning With The Philips Norelco S9000 Prestige Qi-Charge Electric Shaver! Best Buy is the only place you can purchase the Norelco S9000 Prestige Qi-Charge Electric Wet/Dry Shaver! When it comes to deciding whether to use a single edge razor cartridge-based razor, a double edge safety razor, or an electric shaver, you have a lot to consider. Yes, a single edge razor can appear to be the most cost effective, but, it might take you 45 minutes every morning just to shave. The last thing you need in the morning is anything that slows you down! Shaving with a disposable razor takes longer and makes more of a mess to clean up, making it take even longer to shave. 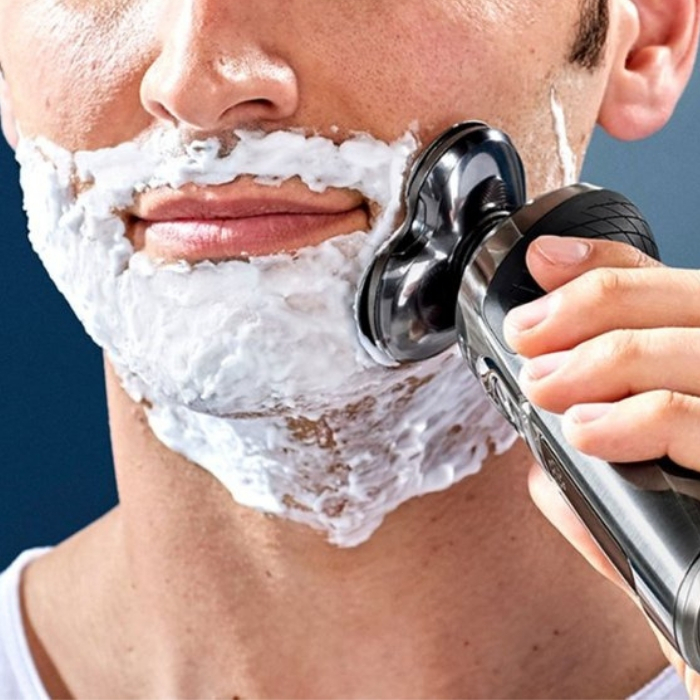 An electric shaver is the quickest way to look sharp every time you shave. In fact, you can get a shave in as fast as five minutes! Imagine having an extra 10 to 15 minutes every day to grab a second cup of coffee, or check out the headlines. Maintain a clean look with the Philips Norelco S9000 Prestige Qi-Charge Electric Shaver. This electric shaver has a sharp, durable set of blades that support effortless shaving as it follows the contours of your face and neck. The Philips Norelco S9000 Prestige Qi-Charge Electric Shaver also features coated rings that facilitate smooth gliding for a comfortable experience. It also comes with three settings: Low, medium, and high, as well as an attached trimmer for you to maximize your styling options. 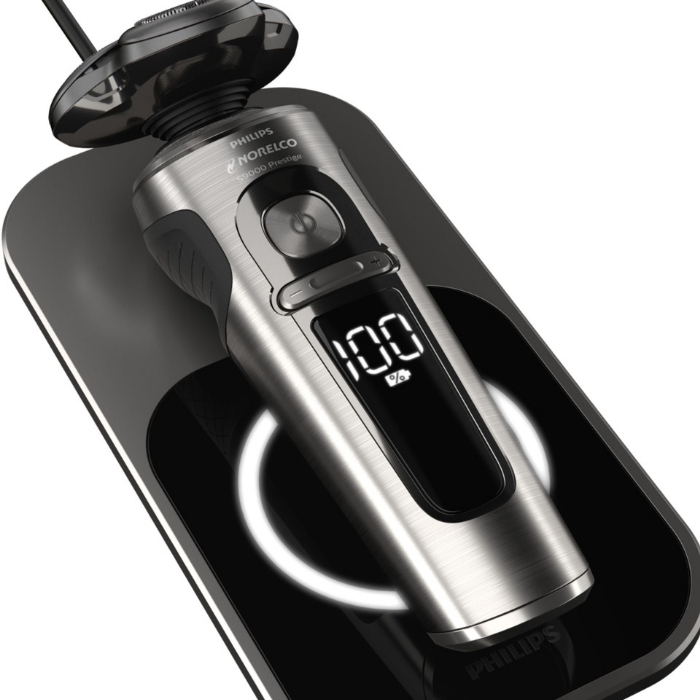 Why Should I Use A Philips Norelco S9000 Prestige Qi-Charge Electric Shaver? This electric shaver enables you to get a highly efficient shave, even if you have a seven-day beard. Use the Philips Norelco S9000 to shave dry or use a gel, foam, or water for better gliding and a smoother skin feeling. Its washable design promotes a simplified cleanup. This electric shaver features an easy three-step cleaning process. No complicated routines. Its high-capacity battery can be fully charged in as little as 1 hour. Giving it up to 1 hour of shaving time. Thanks to its Qi Charger, you can even charge your electric trimer wirelessly! Strengthened with thousands of nano particles that cut hair with the highest precision, you get an extremely close shave at skin level. Move in 8 directions to follow every contour of your face, even catching hair in hard-to-reach areas like your jawline or neck. Each shaving head is surrounded with SkinComfort rings, which have a special protective coating, allowing the shaver to glide smoothly over your skin. Shave a dense beard effortlessly with the BeardAdapt Sensor. It checks hair density 15 times per second and automatically adapts the shaver to your hair density. Finish your overall look with the skin-friendly SmartClick precision trimmer. It can maintain your mustache and even trim your sideburns. The shaver is made with a brushed aluminum finish. It is very lightweight and fits comfortable in the hand. 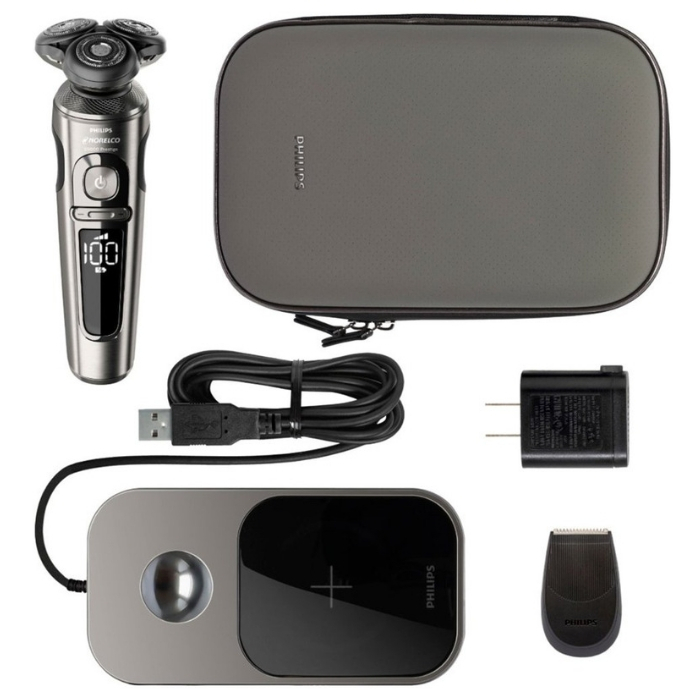 You can get your own Philips Norelco S9000 Prestige Qi-Charge Electric Shaver exclusively from Best Buy for a discounted price of $329.99 ( down from $349.99!). What a great gift this would make – think about Father’s Day – it will be here before you know it! Say hello to a faster and better grooming experience with the Philips Norelco S9000 Prestige Qi-Charge Electric Shaver. This is Philips best shaver, offering the ultimate in closeness and skin comfort. 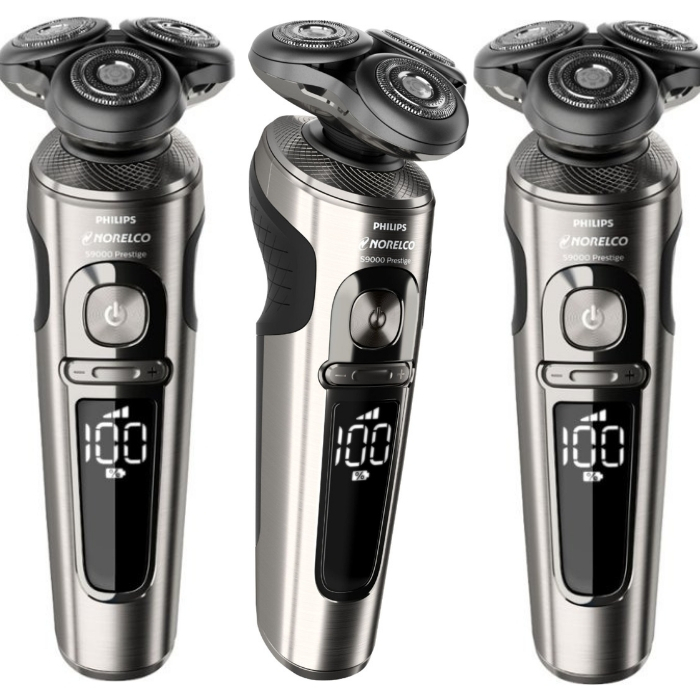 This shaver offers Philips’ closest shave, with a reduction in redness and burning. Best Buy Total Tech Support: Unlimited Support For All Your Tech Needs Whenever And Wherever You Need It! We love electronics, we love trying out new things and being the first to get the newest gadget! But, it can also be frustrating when you get your new gadget and you don’t understand the installation instructions, need to hire a handyman to install it, just having to wait to muddle through all of that is enough of a headache to make you re-think your purchase! Not anymore – Best Buy to the rescue! With Best Buy’s Total Tech Support Membership, those days are over! Buying new electronics is always exciting. From getting a new home theater to a smart home setup, choosing your new set of home appliances will be sure put a smile on you and your family’s faces all year round. However, one of the main problems when it comes to getting new appliances for your home is worrying how long they’ll last. There are times when after using a new TV for two months, you will see lines on the screen or it’s not connecting to the internet anymore. Your TV might still be under warranty — but, the problem is that — it’s the weekend and the store’s technical team is not working on a Saturday or Sunday. PLUS, the next available service is two weeks from now. Does that mean you’re just stuck until then? You can put all those worries behind you with Best Buy’s Total Tech Support. Total Tech Support Membership means Best Buy is dedicated to supporting all the tech in your home — no matter where or when you bought it! You can also get 20% savings on repairs, and protection plans (Geek Squad Protection and AppleCare Products), too! What Are The Benefits Of a Total Tech Support Membership? Unlimited Tech Support: Get help with all of your tech and appliances in-store, over the phone, chat or remote online. Get support when and how you want it. Discounts on Geek Squad Protection and AppleCare: Get the peace of mind at a lower price. You can save big on product protection plans with Geek Squad Protection and AppleCare. Lowered Repairs and Advanced Services: Total Tech Support will handle all the tricky stuff, including major appliance repairs and wiring of security cameras, with 20% off on all repairs and services. Several Services Included: There are many included services such as data transfer, virus removal, and connected car installation. Service for a Cheap: The crew will come to your home and lend a hand for only $49.99 for standard in-home services, including TV mounting and home Wi-Fi setup. Comes With Internet Security Software: Help safeguard against viruses, spyware, and ransomware as the service comes with an internet security software. This software is good for up to three devices. If didn’t know – smart homes are the new “in” thing! You can control your home’s lighting, watch the security cameras from your phone, adjust the thermostat, and control your appliances with just your voice! Sounds like the Jetson’s, huh? Are you ready to start building out your smart home, but, don’t know how? 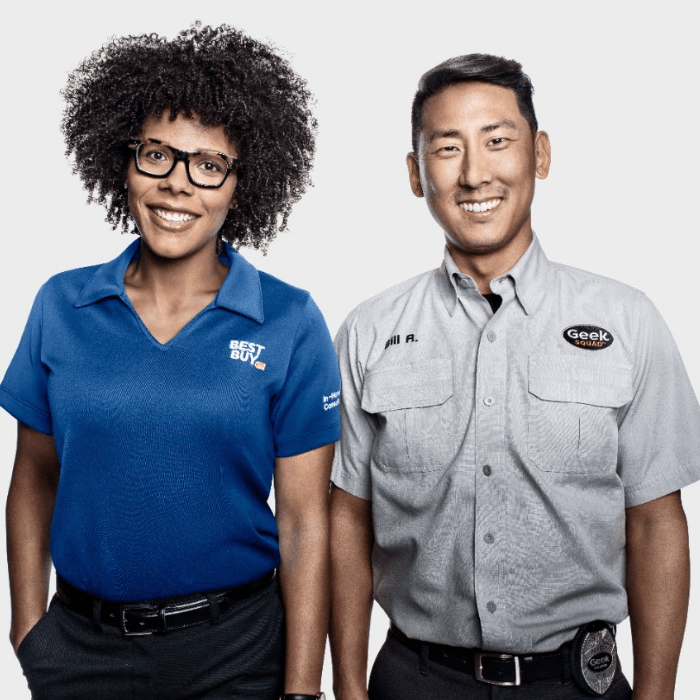 Best Buy’s Total Tech Support can assist in Home Wi-Fi setup, Wi-Fi camera installation, voice assistant setup, smart light setup and customization, smart doorbells installation, and smart thermostat installation for just $49.99 each. All of the above are included with your Total Tech Support membership! PLUS, cars are becoming more and more tech savvy these days, too. Best Buy hasn’t forgotten your car! All of the above services are included with your Total Tech Support membership! Bring the theater home by starting to build your very own home theater. You can watch your favorite shows and movies with your family as a great weekend activity or play games with your friends and grandchildren. If you’re building a home theater, you don’t need to worry about TV mounting, basic audio installation, harmony remote setup, cord cutting, and TV calibration — which can take a lot of time amd be totally frustrating when all you want to do is enjoy your purchase, especially if it’s your first time connecting your TV. For just $49.99 each with the Total Tech Support membership, you can relax and never lift a finger because the team can assist you. Make sure to sign up now for your membership directly from Best Buy and begin enjoying the benefits, now! With the Best Buy Total Tech Membership Support, i’s easier to get your appliances fixed or install new ones! The service is affordable and reliable. You’ll have peace of mind because you can connect with them 24/7 in-store, over the phone, or chat/remote online, so you get support when and how you want it! 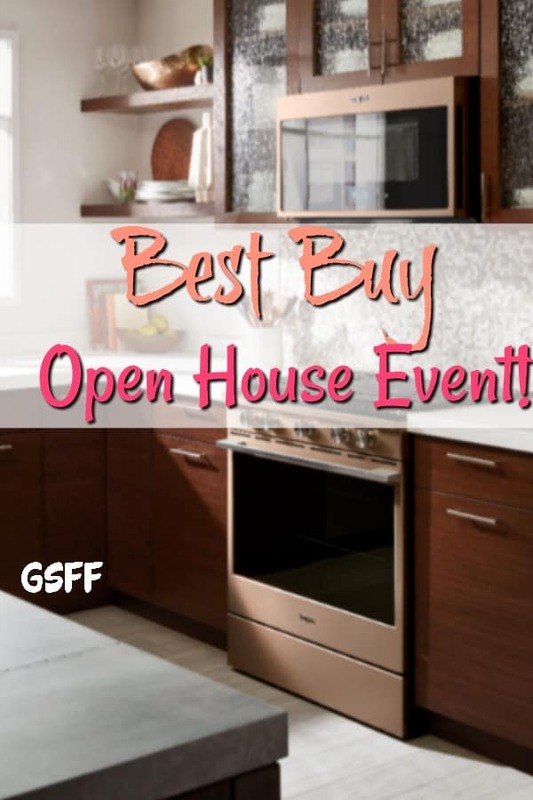 Discover What’s New While Enjoying Exclusive Offers With The Best Buy Open House Event! Discover What’s New While Enjoy Exclusive Offers With The Best Buy Open House Event! New year, better home! 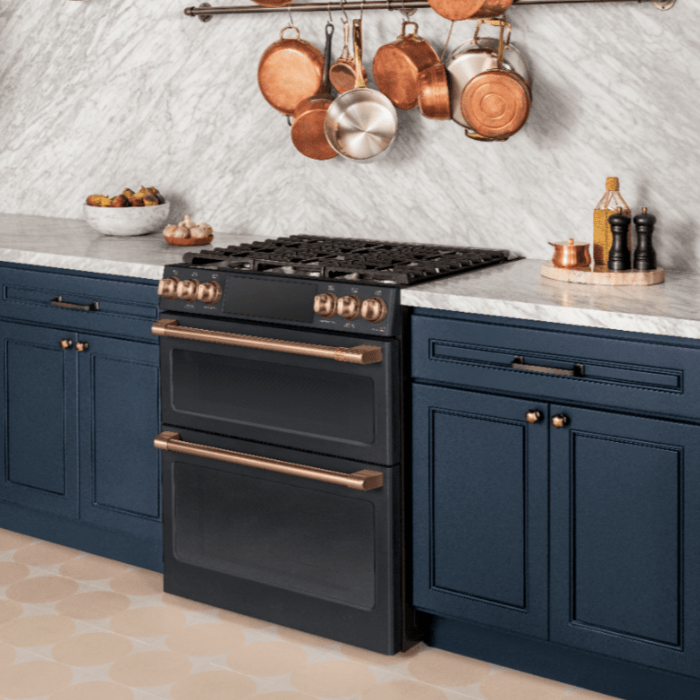 Are you in the market for new appliances? Are you planning to upgrade your home to a smart home? I have said it before and I will say it again we are BIG tech geeks! We love all things tech! Let me explain – we LOVE USING tech – lol – we have Google Homes, Google Home Hub, Amazon Alexa, smart phones, computers, tablets, cameras, a Chromebook, robovac, and gadgets galore – so, anytime we can visit Best Buy is a fun day for us! Technology plays a big role in our daily lives. However, buying new appliances can leave a large hole to your pocket — unless you buying from a Black Friday, Cyber Monday, or Boxing Day sale. Plus, if you’re impulsively buying electronics, you probably haven’t thought through if it’s what you want or need and if the purchase is good for your budget. 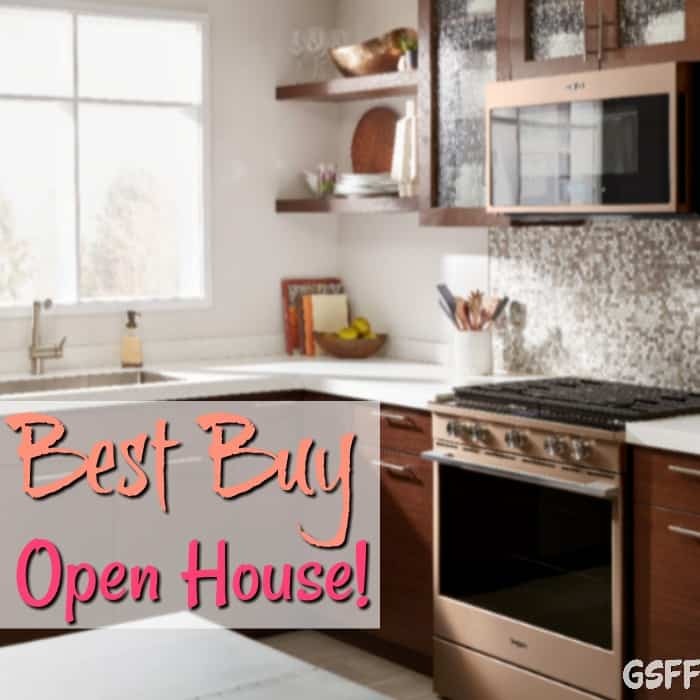 If you are planning to buy a new television, sound system, home theater, dishwasher, or refrigerator, head over to select Best Buy locations this Saturday, January 19, from 11:00 AM to 3:00 PM for their Open House Event. 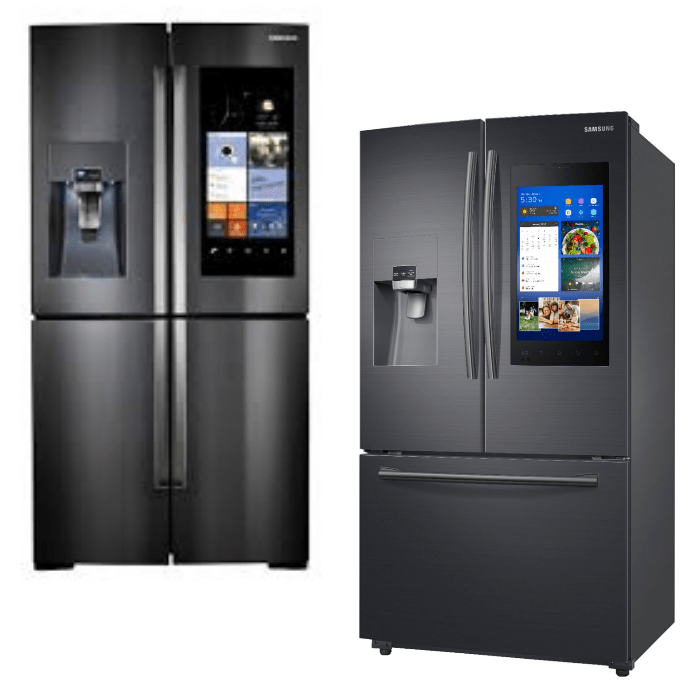 Best Buy’s Blue Shirt experts can help you experience the best in major appliances from Café, GE, Samsung, and Whirpool! You can discover what’s new in Home Theater, see how small appliances can simplify your life, and receive free upgrade checks with Best Buy Mobile! More Fun Stuff In Store For You! 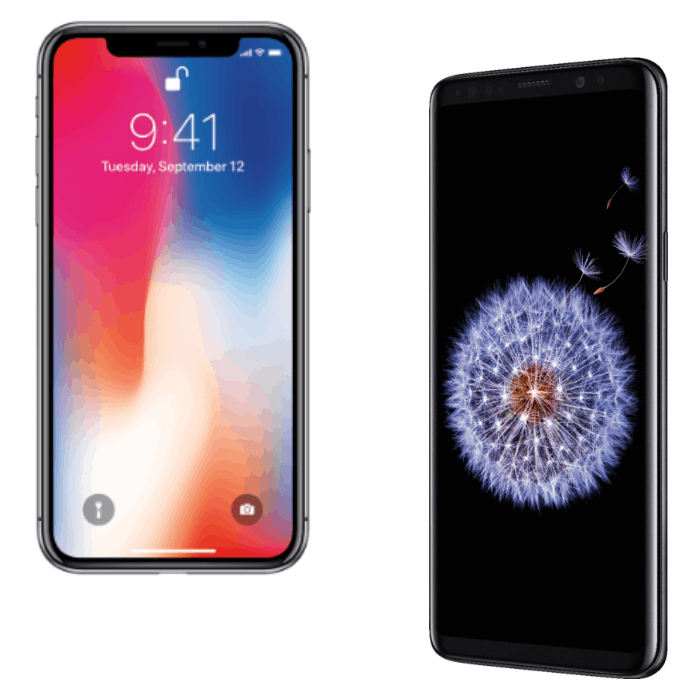 At the Best Buy Open House Event, you will not only learn about the latest tech, you can also get access to exclusive offers and more fun stuff! Get a free $100 Best Buy Gift Card when you buy two or more appliances priced $999 or more. The coupon will be given out during the event itself and can be used for in-store purchases only. You can redeem the free gift card from Saturday, January 19, until Monday, January 21. Get a chance to win a Whirlpool Washer/Dryer set or a Samsung 55” Smart TV. Be one of the first 75 people to register for a chance to receive a Best Buy gift card of up to $20 in value. Best Buy offers a wide array of appliances that can fit any budget and style preferences. You can design anything from a simple kitchen to a smart laundry room. Explore tech-forward and time-saving models and test them yourself! Check out professional products from a wide range of brands during the event! 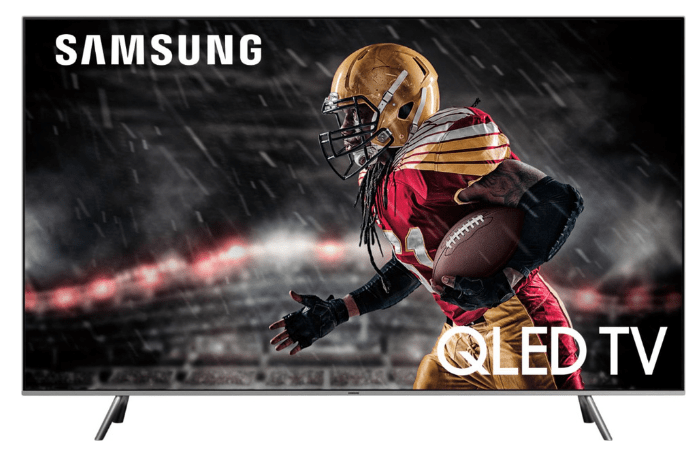 Experience Samsung QLED TVs that deliver pure entertainment for watching enjoyment. Check out the latest models available on AT&T, Verizon, and Sprint. Plus, you can check your upgrade availability and receive $5 in Best Buy rewards. 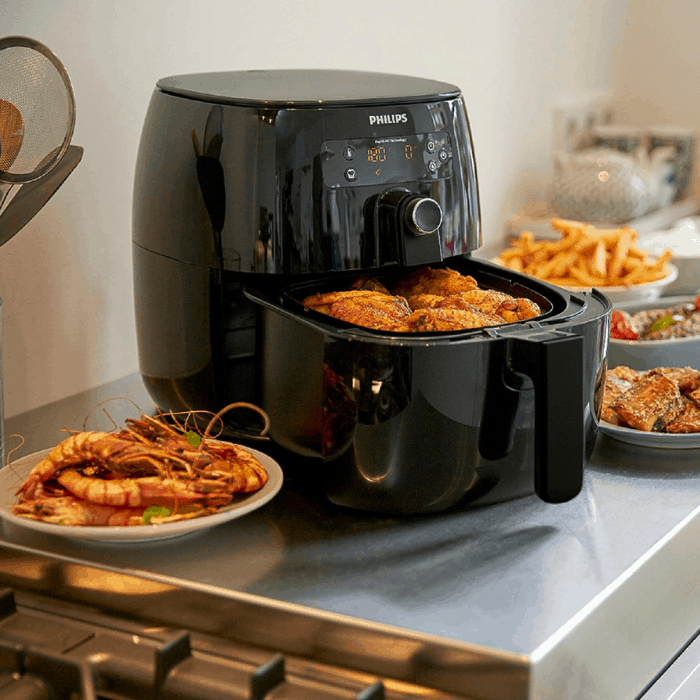 At the Best buy open house be sure to check out a demo of the Philips Avance air fryer than produces healthy, tasty snacks and meals with little to no oil, too! Plus a ton of other demos! The Best Buy Open House Event will take place in 17 stores across the US! Make sure to visit a participating Best Buy store near you! Visit the Best Buy Open House Event website for more details and learn which store near you is hosting the event. Be sure to share all of the fun stuff at the event on your social media channels so that people in other areas can experience some of what you’ll experience, too!